When used appropriately, prescription opioids can be an integral component of treatment for chronic and acute pain. Yet serious risks—including misuse, addiction, overdose, and death—highlight the importance of carefully considering the risks versus the benefits of opioid use.1 The current opioid abuse crisis is a complex problem that requires a comprehensive management approach. To reduce prescription opioid misuse, opioid stewardship programs in US hospitals are becoming increasingly prevalent. The opioid stewardship program at The Penn State Milton S. Hershey Medical Center in Hershey, Pennsylvania, was launched in 2016 as an interdisciplinary response to The Joint Commission’s Sentinel Event Alert Issue 49: Safe Use of Opioids in Hospitals, which recommends a multimodal approach to pain management.2 Modeled loosely on antimicrobial stewardship programs, the opioid stewardship program is tasked with ensuring the safety of patients with regard to use of opioid analgesics. Promoting multimodal analgesia is the central objective of the opioid stewardship program; the intent of this multifaceted approach is to improve pain management while decreasing side effects and the need for opioids. The program is an interdepartmental initiative with representation from anesthesiology and perioperative medicine, nursing, and pharmacy; members include the five chronic pain attending physicians, two nurse practitioners, and a pharmacist. The responsibilities of each of these team members are noted in TABLE 1. The opioid stewardship program provides pain management consultative services and works to identify patients at risk for adverse events as well as potentially risky opioid ordering practices. 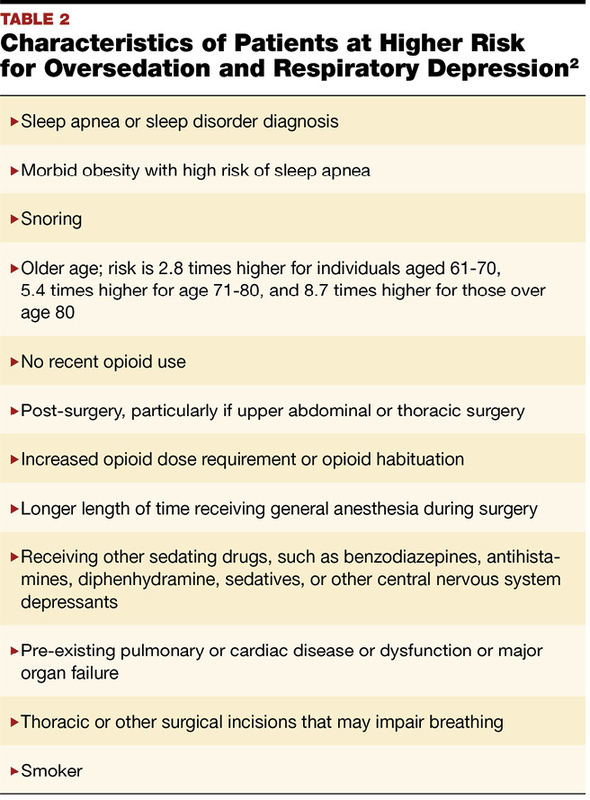 Patients with co-morbidities are seen in a pre-admission anesthesia clinic to obtain a full history, conduct a physical, and provide directions for which medications to take the evening before and the morning of surgery. During the clinic visit, patients are screened for chronic opioid use; for the purposes of the screening, chronic opioid use is defined as taking the equivalent of 30 mg oral morphine daily for at least 30 days. If a patient is identified as a chronic opioid user, the surgeon and the anesthesia staff are notified that opioid-sparing techniques (eg, use of ketamine, magnesium, or regional anesthesia) may be beneficial and to ensure all team members are aware that pain control may be challenging in the post-operative period. During consultations, the pain team promotes the use of acetaminophen, non-steroidal anti-inflammatory drugs, and adjuvant agents where appropriate. In addition, the program promotes opioid-sparing techniques, including hot/cold therapy and massage; patient education; appropriate prescribing; and destruction of leftover opioid medications. The pharmacist reviews all orders for patient-controlled analgesia (PCA) with basal infusions. Unless the infusion replaces an established opioid regimen, the provider is contacted and educated about the potential risks associated with continuous infusions of opioids. 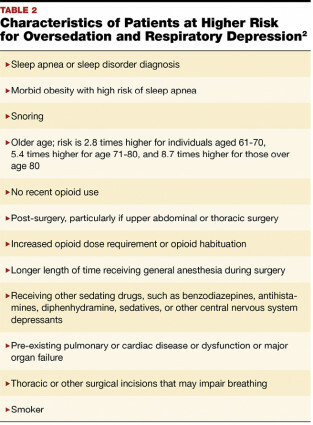 After careful consideration of the risk factors for sedation and respiratory depression (see TABLE 2),2 the opioid stewardship program determined that identifying which patients might develop symptoms would be an ongoing challenge. Patients at increased risk still require pain control, which often necessitates the use of opioids. Thus, the program focused much of its early efforts on educating nurses about these risk factors, promoting multimodal analgesia and monitoring patients. Because nurses have the most interaction with patients, and all patients are at some risk for adverse effects, nurses are in a unique position to observe changes in patients’ mental acuity and therefore can ensure safety for those patients receiving opioids. 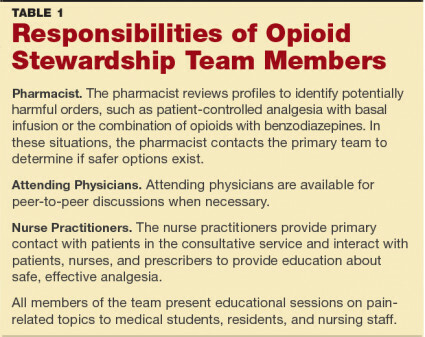 Development of an Opioid Stewardship Leadership Team. In the past year, the medical center added an opioid stewardship leadership team, guided by the director of the chronic pain division. Members of the opioid stewardship program are involved in the leadership team, along with representatives from hospital administration, emergency medicine, family and community medicine, psychiatry, surgery, physical medicine and rehabilitation, and nursing. The leadership team provides oversight of stewardship activities, sets priorities, and serves as a central reporting point for opioid-related issues. 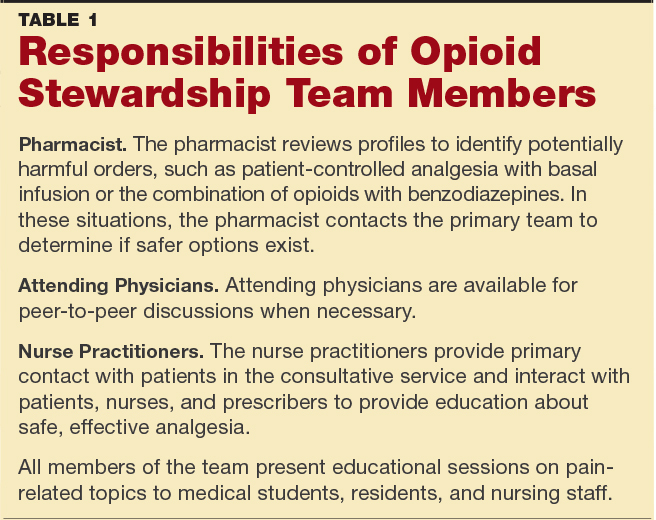 The leadership team categorizes opioid stewardship activities as patient-focused, caregiver-focused, staff development, provider expertise development, substance abuse treatment, and community engagement. Many activities, such as patient education, were already in place. Review of Educational Materials. The new Joint Commission pain standards served as an impetus to review and update educational materials provided to patients. The previous materials acknowledged the risk of addiction; the updated version describes the risk in stronger language. The new materials also explain the goal of using opioids for only the shortest time possible, using non-opioid analgesics, and highlight pain management rather than the elimination of pain as the goal of treatment. Implementation of a Warm Hand-Off. The substance abuse treatment and emergency medicine providers developed a warm hand-off of emergency department patients in need of addiction treatment. A warm hand-off is defined as a transfer of care between two members of the health care team with the patient and their family present. This transparent hand-off of care allows all parties to engage in communication, giving patients and their families the opportunity to clarify information or ask questions about their care.4 The method helps ensure patients begin addiction treatment rather than simply relying on the patient to make arrangements after they leave the emergency department. Development of an Outpatient Opioid Stewardship Clinic. The Chronic Pain Division partnered with Family and Community Medicine to implement an outpatient opioid stewardship clinic, which takes referrals to wean select patients off their opioid regimens. These patients include those on chronic opioids and those who have been titrated to high doses during an acute pain event. Evaluation of Current Prescribing Practices. Like many other institutions, the Penn State Milton S. Hershey Medical Center recognizes that discharge prescriptions often introduce excess medications into the community. As such, only appropriate amounts of opioid analgesics should be prescribed at discharge; therefore, medical center providers are working to decrease the amounts prescribed. Under the guidance of the opioid leadership team, work groups are being formed to evaluate current prescribing practices, set goals for further reductions, and monitor progress toward those goals. Participation in Drug Take-Back Days. Even with reduced prescribing, it is inevitable that some patients will have leftover medications. The medical center has taken part in drug take-back days twice yearly for several years. In addition to those efforts, we are working to increase access to medication drop boxes by installing three at various sites on campus. The boxes will be located near clinics, which will make it convenient for patients and families to dispose of leftover medications when they come for follow-up visits. Medical center staff are also educating patients on proper disposal at home in case they prefer not to bring medications to the medical center. The Penn State Milton S. Hershey Medical Center has seen a decrease in reliance on opioids in the acute inpatient setting, and there is less use of opioids for mild pain. In addition, patients are receiving better education about the value of utilizing multiple analgesics to improve pain management and lower the risk of side effects. To ameliorate the effects of the opioid abuse epidemic, it is critical that health care providers recognize the urgent need to be responsible stewards of opioids. Implementing an opioid stewardship program can significantly impact safe opioid use and promote multimodal analgesic treatment. A new ASHP certificate program offers advanced training in pain management. More information is available at: https://store.qualityforum.org/products/national-quality-partners-playbook™-opioid-stewardship. Centers for Disease Control and Prevention. Prescription Opioid Data. www.cdc.gov/drugoverdose/data/prescribing.html. Accessed September 20, 2018. The Joint Commission Sentinel Event Alert. Safe use of opioids in hospitals. Issue 49, August 8, 2012. www.jointcommission.org/assets/1/18/SEA_49_opioids_8_2_12_final.pdf. Accessed September 19, 2018. The Joint Commission. Perspectives. New and Revised Standards Related to Pain Assessment and Management. Effective January 1, 2018. https://www.jointcommission.org/assets/1/18/Joint_Commission_Enhances_Pain_<br>Assessment_and_Management_Requirements_for_Accredited_Hospitals1.PDF"
Assessment_and_Management_Requirements_for_Accredited_Hospitals1.PDF. Accessed September 19, 2018. Agency for Healthcare Research and Quality. Warm Handoff: Intervention. https://www.ahrq.gov/professionals/quality-patient-safety/patient-family-engagement/pfeprimarycare/interventions/warmhandoff.html. Accessed September 19, 2018. National Quality Forum. National Quality Partners Playbook: Opioid Stewardship (March 2018). https://store.qualityforum.org/products/national-quality-partners-playbook™-opioid-stewardship. Accessed September 19, 2018. Thomas Vissering, RPh, MBA, is the opioid stewardship pharmacist at The Penn State Milton S. Hershey Medical Center in Hershey, Pennsylvania. He earned his BS from the University of Iowa and his MBA from the University of Illinois at Chicago.